One of my favorite little bites on the dishes I get when I go to my fave restaurants are the pickled onions, radishes, or other veggies. My favorite salads have pickled beets or pickled red onions. There is a turkey burger I love that features pickled radishes. And my son…he adores refrigerator pickles like my mother-in-law makes. 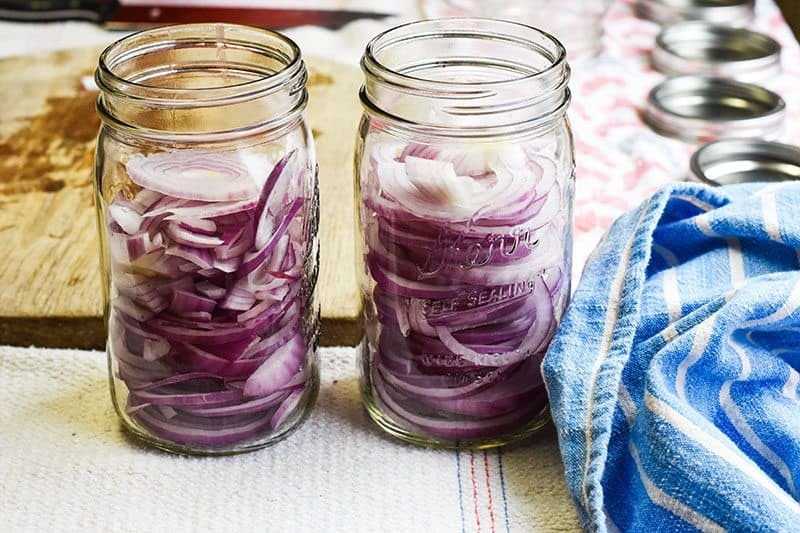 Pickled onions and other veggies is crazy easy to make. I made these jars in under an hour. No really! And don’t say it’s because I am fast and know what I’m doing. Truth be told, many of you could do it in less time. Especially if you utilize a mandolin or other slicer. I did the slicing by hand which, of course, is much slower. 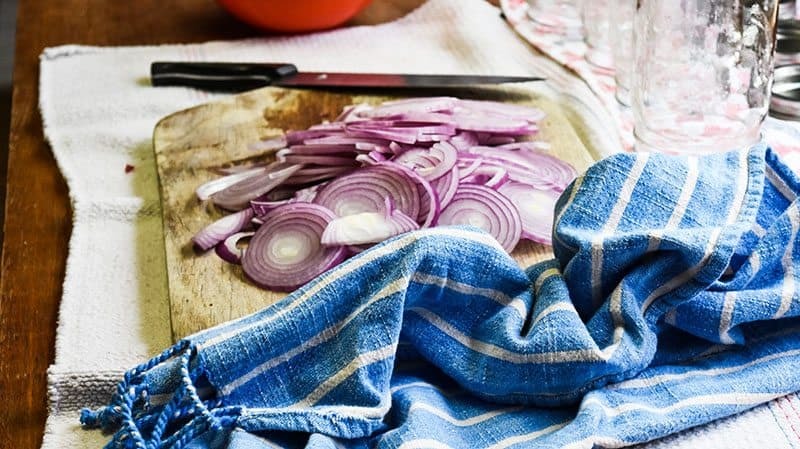 The worst part of slicing onions if, of course, getting the towels full of onion smell. I have to have a cloth nearby to wipe my hands off repeatedly. And then…the towel smells, of course. But look at those pretty jars all ready to be filled with brine! I cannot WAIT for pickled onions. On burgers, on salads, just because. Sooo excited! You totally can just stick with the simple vinegar brine and it would taste great! However, adding a bit of fresh herb and garlic is a quick and easy way to change up and deepen the flavor. I added fresh thyme sprigs, smashed garlic (another smelly hands one…gross! ), and fennel seeds to my onion. Rice vinegar, white vinegar, and apple cider vinegar all work great. Some veggies will need to be blanched or cooked before pickling. Green Beans, Asparagus, and Beets would be some. Do a quick Google search before starting. Traditionally, the veggies that we often eat raw are the best candidates for quick pickling without cooking first. The salt & sugar measurements can be altered to your own tastes. Veggies will “last” for months in the fridge but will continue to lose texture the longer they sit. Eating them within a few weeks of making them will have the best flavor and texture. 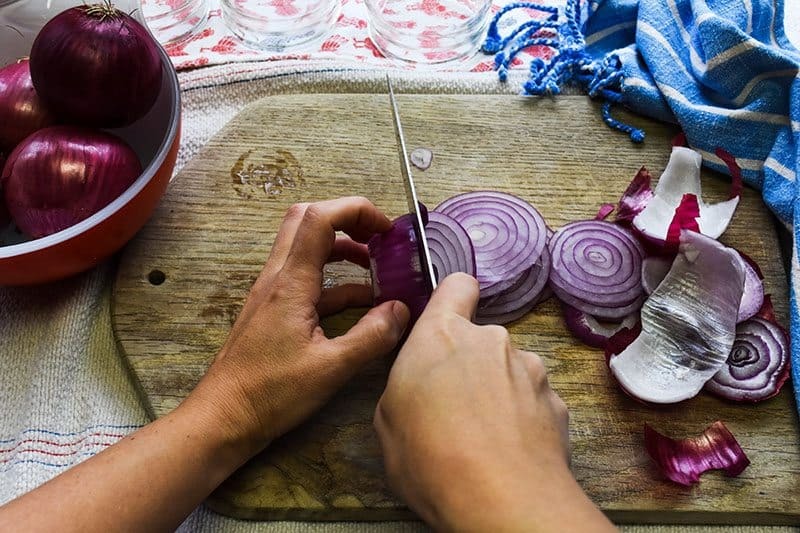 While you need to wash and trim the veggies, peeling them is completely up to your tastes. The radishes have just a bit of fennel seed in the brine mixture. 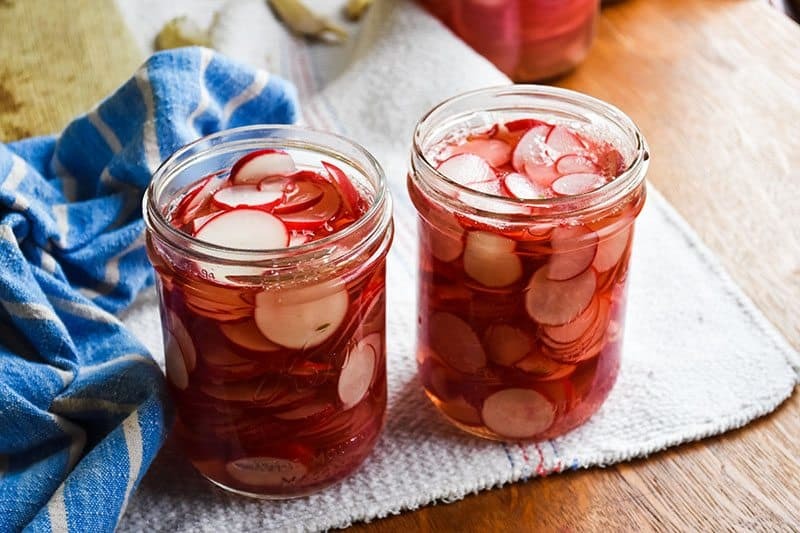 I find radishes to already be so flavorful that they don’t need anything else to brighten their flavor. Aren’t those just the cutest! And the quick pickles Levi loves! Peeled and sliced cucumbers. A bit of garlic. If I had it I would have added fresh dill. But I don’t and am not at all worried about these making their way to his belly. I give them a day before they are gone. Good thing they are crazy easy to make! These jars will keep in the fridge for between 2-4 months. I will be making up a bunch more with pretty little lids and labels and gifting them for Christmas. Everyone likes pickled veggies in pretty jars, right?!? 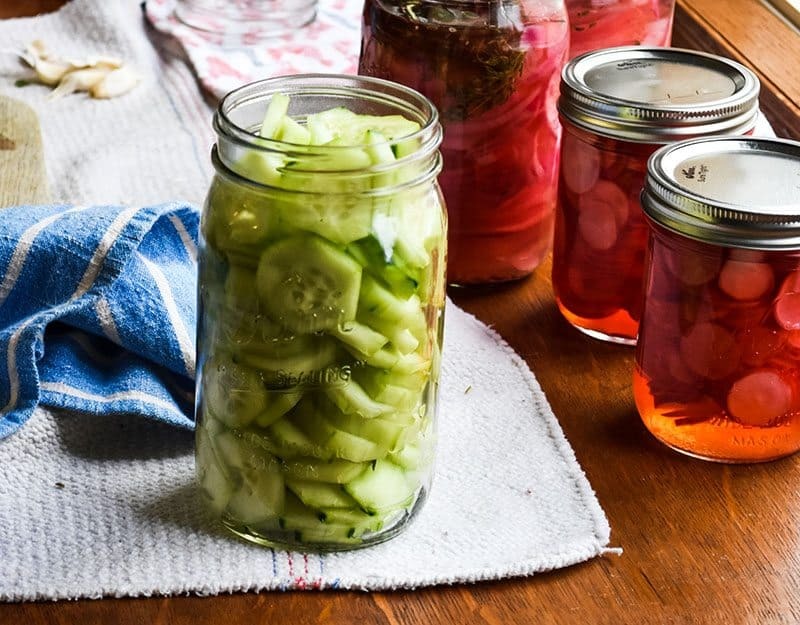 Tell me, what are YOUR favorite pickled veggies? Bring water, vinegar, salt, and honey to a boil. 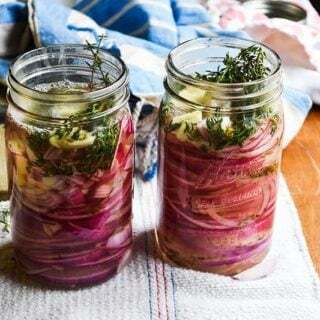 Stuff a mason jar with sliced veggies, shaved fennel, and fresh thyme up to about an inch from the top of the jar. Fill with brine almost to the top. Let cool, cover, and store. Store these in the fridge for a couple of months. However, they are best eaten from 2 days-2 weeks after made. You'll find the sweet spot. Experiment with different spices and veggies. 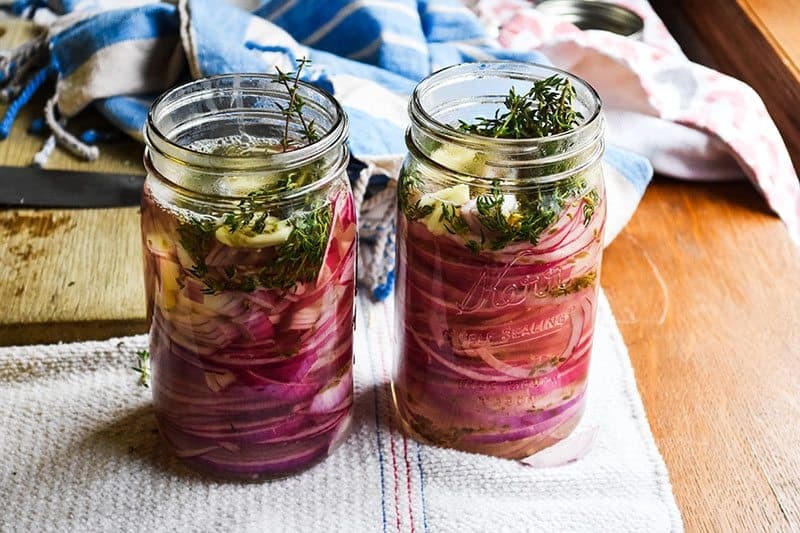 Janel………..after bringing the brine to a boil, do you pour it immediately over the veggies in the jar, or do you let it cool first? I hope things work out for your office!